Daily Mail Newspaper - Diabetes Foot Care Feature | Life, Sport and Diabetes - An everyday look at my life with type 1 diabetes. 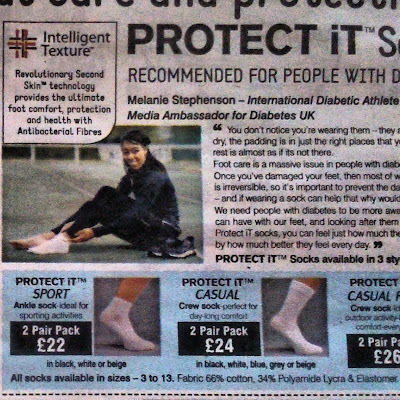 Today I was really pleased to be featured in the diabetes foot care and Protect it sock advert in the Daily Mail national newspaper. Today's paper had a special focus on health care and Protect it socks were an important part of it. 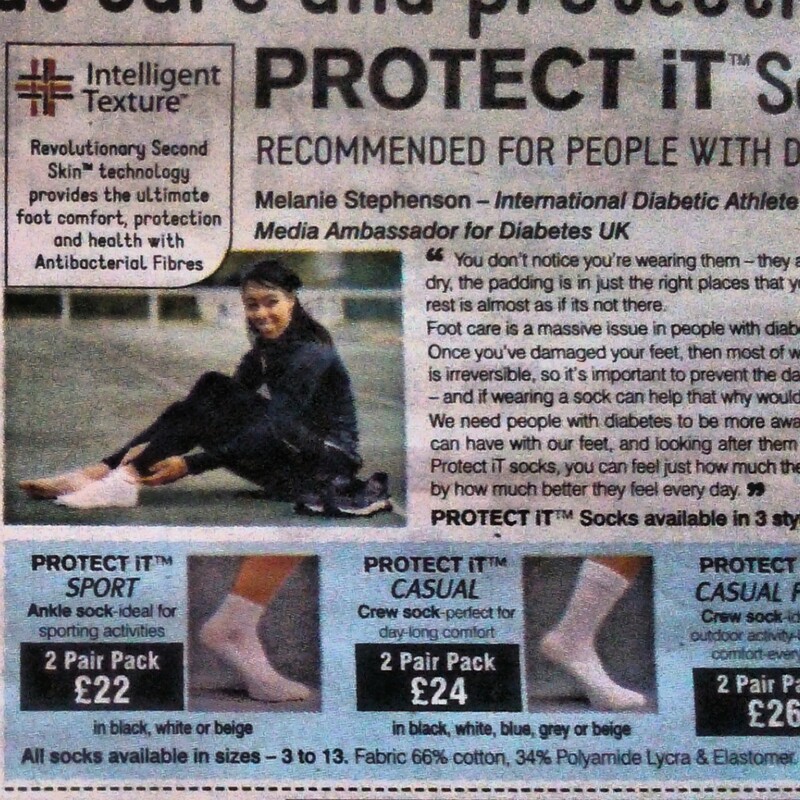 As I've mentioned previously people with diabetes- young and old, with type 1 or type 2 have to look after their feet. As it's a well know fact that diabetes is the biggest cause of amputation, so we have to look after ourselves so as not to leave any long lasting effects. The reason the Protect it socks are so helpful in managing foot care is that the socks have different zones for different functions around the foot. If I had to pick the two most important ones from the point of view of a sportsperson with type 1 diabetes, then firstly I would point out the sole of the sock. The reason for this is that their construction is all one even level at the base. Which means that there are no lumps and bumps present to cause friction and blisters that can cause infection. This level also absorbs moisture keeping the foot cool and dry. Secondly there is a ventilated layer on top, that also keeps the foot cool- which reduces the possibility of things such as athletes foot. Which is a fungal infection which causes the foot to become itchy and irritated. This layer also has the added benefit of temperature regulation, which is exactly what's needed during these warm summer months! So don't take any chances with your feet... Protect it!